Recieving tuition from Miyagi An'ichi Sensei. Sensei George Andrews's first exposure to the fighting traditions was in the year 1960. When as a schoolboy 10 years old he joined the Fitzroy Lodge Boxing Club in South London and boxed for his school. He applied to join his first karate dojo in 1965 but was turned away as he was too young. He persevered and in 1967 he took his first karate class. The style was Mushindo (Lit: no mind way) which was a mixture of styles of karate. He graded to the rank of Nidan in 1972. In 1973 he was exposed to Okinawan Goju Ryu. He ceased training in Mushindo and devoted all his energies to training in Okinawan Goju Ryu Karate-do. Three years later in 1977 he met and trained under Sensei Higaonna Morio, this was to be the first of a lifetime of training with Higaonna Sensei. Sensei Andrews opened his first full time dojo, the famous 'Marble Factory', in Camberwell, London in May 1974. At it's height the dojo was teaching an average of 1000 students per year. Many of karate's most famous names have trained and stayed at the dojo, Sensei Higaonna, Sensei Chinen Teruo, Sensei James Rousseau, Sensei Kato Tomoyuki, Sensei Onaga Roichi, Sensei Suzuki Tatsuo (Wado Ryu), Sensei Kimura (Shito Ryu), and from England, Sensei's Brian Waits, Steve Bellamy and the Editor of Fighting Arts, Terry O'Neil. Sensei George Andrews first visited Japan in 1985. He trained twice daily with Sensei's Higaonna and Kato for the seven weeks he was there. Sensei George Andrews has taught in many different countries around the world and continues to do so including the USA, Russia, Europe, Iceland, Poland, Israel, Thailand and Australia. 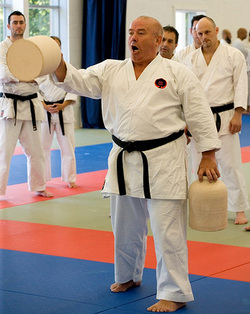 In 2002 Sensei Andrews formed the Okinawan Traditional Goju Ryu Karate-do Association (OTGKA) to preserve and continue the traditions and teachings of Sensei Higaonna Morio and the IOGKF in England. During the 6th IOGKF World Budosai in Okinawa, July 2012, Sensei Andrews was examined for his 8th Dan under the watchful eye of Higaonna Sensei and the IOGKF grading panel. At the closing Sayonara party Higaonna Sensei announced that Sensei George Andrews has achieved the rank of Hachidan. 30 Years. From Then Until Now.